Around 2000 beacons have been installed across Gatwick Airport’s two terminals providing an indoor navigation system that is claimed to be much more reliable than GPS and one that enables augmented reality wayfinding for passengers. 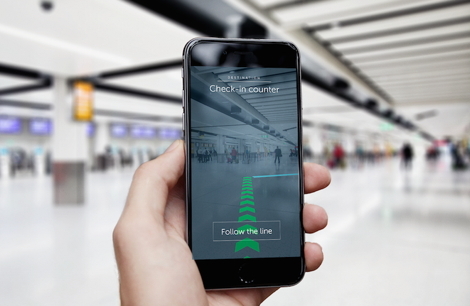 The new navigation technology is currently being integrated into some of the Gatwick apps and the airport is also in discussion with airlines to enable the indoor positioning and wayfinding tools to also feature on their app services – the beacon system also enables an augmented reality wayfinding tool – so passengers can be shown directions in the camera view of their mobile device – making it easier for passengers to locate check in areas, departure gates, baggage belts etc. As usual it is stressed that no personal data will be collected by Gatwick although generic information on ‘people densities’ in different beacon zones may help to improve airport operations including queue measurement, streamlining passenger flows and reducing congestion. Of course, Airlines could go further – and with the consent of their passengers – send reminders on their airline app to late running passengers, for example, or find out where they are and make an informed decision on whether to wait or offload their luggage so the aircraft can take off on time. Retailers and other third parties may also use the beacon system to detect proximity and send relevant offers or promotional messages, if the passenger has chosen to receive them. The new technology is part of Gatwick’s £2.5 billion investment programme to transform the airport. This entry was posted on Tuesday, May 30th, 2017 at 10:28 @477 and is filed under DailyDOOH Update. You can follow any responses to this entry through the RSS 2.0 feed. You can leave a response, or trackback from your own site.